Nigeria being a country endowed with a lot of Oil & Gas resources, the management of Morpol Engineering Services Limited, had a long term vision of setting up a department/unit solely responsible for Pipeline Construction. Unfortunately, due to the prevailing circumstances then, this unit could not take off for a long time. 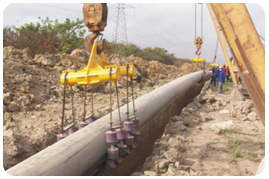 In view of the Federal Government’s policy plan and desire to expand the local gas infrastructure coupled with the Nigerian Content Act, which came into effect in 2010, Morpol diversified her activities by activating the Pipeline Construction Unit. Our vision and mission is to work strategically in order to place Morpol amongst one of the top six (6) indigenous EPC – Pipeline Construction companies of choice. After just a few years of diversification into the Pipeline construction business, we are proud to state that Morpol is today a force to be reckoned with in this sector.